The N 262E11 binary input device is a 6 module units wide DIN rail mounted device in N-System dimensions with 16 inputs for potential-free contacts. 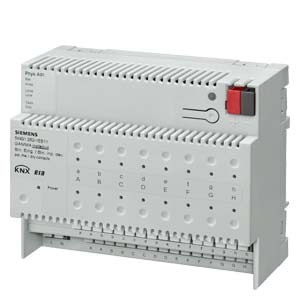 It enables both statuses (contact is open or closed) and changes in status (contact became opened or closed) to be recorded by means of voltage impulses generated inside of the device. It can therefore be used, for example, to monitor the switching or operating states (whether a device or a plant is switched on or off, whether a limit violation or a malfunction or an alarm is being signalled), to record the change of status when switching on or switching off (whether a switch or a pushbutton was activated, whether it was activated for a shorter or longer period) and to record and count changes of the switching status (i.e. pulses) with a minimum on-time of the contact of 70 ms and a max. pulse succession of up to 5 pulses per second, without or with monitoring of the number of pulses counted until a predetermined threshold has been reached or exceeded. At each input a red LED shows whether the connected contact is open (LED is off) or closed (LED is illuminated). The N 262E11 has an integrated 230 V power supply in order to supply the electronics. This power supply enables the generation of the voltage pulses for checking the switching statuses and for displaying them via the LEDs even when there is no bus voltage present. Note: The device is without function after the application program has been “unloaded” with the ETS. The status of the inputs is also no longer displayed in this case.